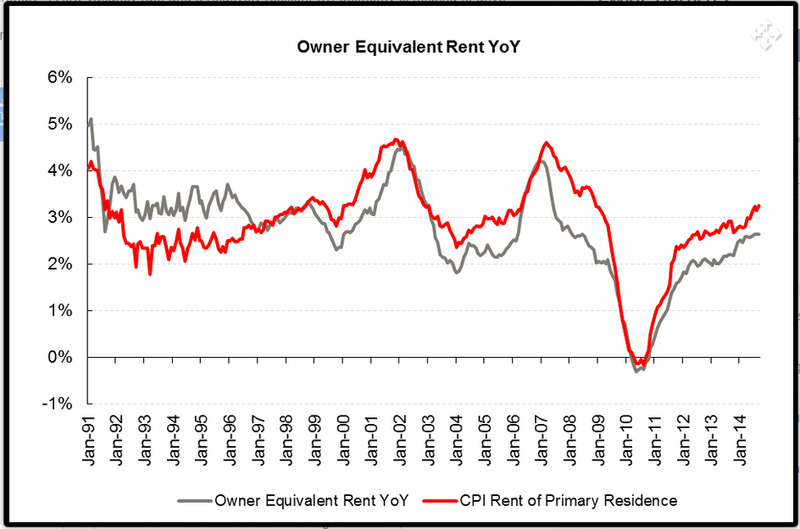 Mish's Global Economic Trend Analysis: Rents Heading Up? 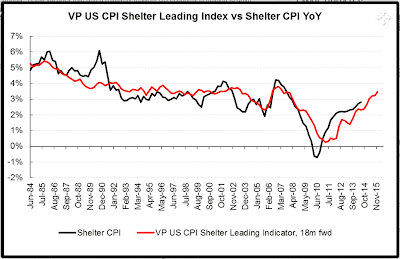 Will the CPI Follow? Rents are up 6.5% in San Francisco, and 4.5% in numerous other cities. Is this a leading indicator for a stronger inflation as measured by the CPI? The red line in the above chart is not the CPI, but rather a "leading indicator for US Shelter CPI, which includes apartment vacancy rates"
I took the above chart, clipped out the red CPI line, made a layer out of it in Photoshop, and then shifted the line back 18 months with reduced opacity so you can see both lines. Here is my result. Straight up (no shift) caught most of the action correctly, except for years 2005-2006, right at the peak of the housing bubble. Also recall the energy spike in 2007. Perhaps a shift forward some smaller number of months other than 18 would fit better. Let's dive into the CPI data to see what if anything a bump in OER might mean. 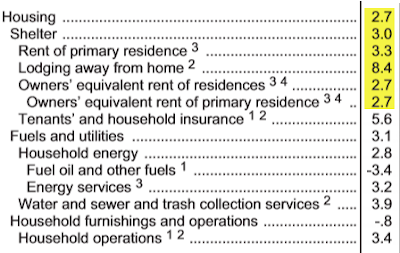 Here's the Housing Component of the CPI straight from the October 2014 BLS CPI Report. 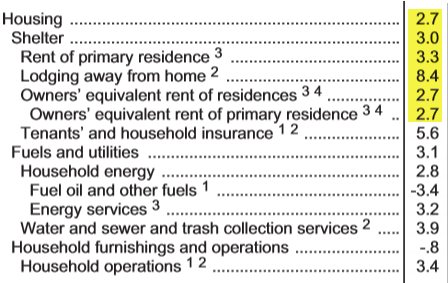 The last column above is the year-over-year increase in various housing components. Numbers are national. On average, if the largest cities are up 4.5% or so (excluding San Francisco), the national average of 2.7% for OER and 3.3% for rent seems reasonable enough. 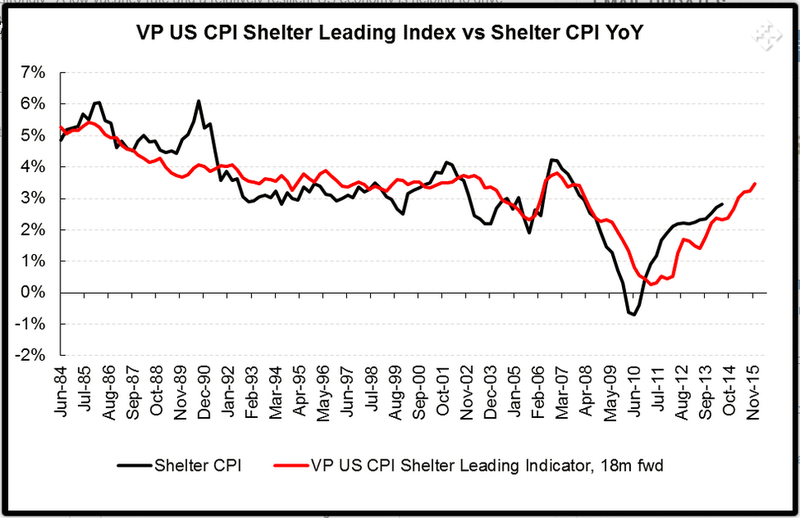 CPI-U Consumer Price Index for All Urban Consumers is up 1.7% year-over-year even though housing is up 2.7%. So other things had to go down. Price for energy did just that. Nonetheless, CPI will tend to move with OER simply because OER is the single largest component. If rents continue to rise, CPI will likely go along for the ride, but I fail to see any leading direction in the OER itself (first chart) unless one can accurately project "planned rent hikes". 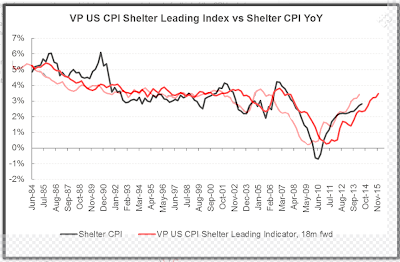 With that thought in mind, let's return once again to the claim "Our leading indicator for US Shelter CPI, which includes apartment vacancy rates and the growth in the working-age population among its inputs, shows that the trend should continue." If vacancy rates are a leading indicator of planned rents hikes (a reasonable presumption), then the statement made by Variant Perception is likely an accurate one. Yet, the overall impact on the CPI will at best be subdued, especially if wages do not follow. If more money goes for rent and Obamacare, less money will go elsewhere. Consumers feeling the squeeze? You bet!